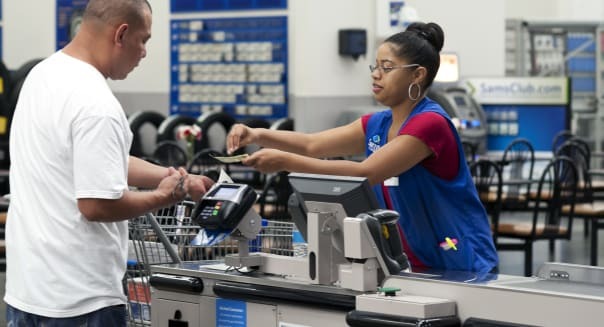 WASHINGTON -- U.S. consumer spending rose less than expected in May, likely held back by weak health care spending, which could prompt economists to temper their second-quarter growth estimates. The Commerce Department said Thursday consumer spending increased 0.2 percent after being flat in April. Spending, which accounts for more than two-thirds of U.S. economic activity, had been forecast rising 0.4 percent. When adjusted for inflation, consumer spending fell for a second straight month, suggesting spending this quarter could struggle to regain momentum after growing at its slowest pace in nearly five years in the first quarter. Spending in May was probably constrained by weak health care spending as outlays on services barely rose for a second month. Spending on automobiles surged, accounting for more than half of the rise in durable goods outlays. U.S. Treasury debt prices rose on the data while the dollar trimmed gains. Reports on employment to manufacturing and the services industries suggest the economy has rebounded after sinking in the January-March period, but the spending data indicated that growth would probably fall short of expectations. "The consumer spending number is not enough of an acceleration to give confidence to large second-quarter GDP rebound numbers," said Alan Ruskin, global head of G10 foreign exchange strategy at Deutsche Bank (DB) in New York. Second-quarter growth estimates have ranged as high as a 4 percent annual pace. The economy contracted at a 2.9 percent pace in the first quarter, the worst performance in five years. The declining claims suggest a recent streak of payroll job gains above 200,000, is likely to be sustained, lending the economy enough momentum for inflation to start perking up. A price index for consumer spending increased 0.2 percent in May, rising by the same margin for a third consecutive month. In the 12 months through May, the personal consumption expenditures price index was up 1.8 percent, the largest gain since October 2012. It had advanced 1.6 percent April and should comfort Federal Reserve officials concerned about price pressures being too low. Excluding food and energy, prices also posted a 0.2 percent gain. That followed a similar increase in April. The so-called core PCE price index increased 1.5 percent from a year ago. That was the biggest increase since February last year and followed a 1.4 percent rise in April. Both inflation measures still remain below the Fed's 2 percent inflation target. Inflation, which has been depressed by weak medical care costs and sluggish wage growth, is being watched for clues on the timing of the central bank's first interest rate hike. The Fed, which is scaling back the amount of money it is pumping into the economy through monthly bond purchases, has kept its benchmark lending rate near zero since December 2008.